This delicious “anytime dish” I make about once a month. We love it not only for its taste, but also for the flood of memories it brings back to us. It was in the “before kids” time of our lives when my husband and I dropped everything and moved to Switzerland for a year. He worked for a company over there and we lived right in the heart of the country.. Luzern. On our weekends we would just hop on a train and go explore a new town or even country. We went to Italy, France, Germany and Austria.. all just a few hours away. Switzerland is a small country and its regions all vary culturally depending on which country it borders. For example, Basel is close to France and the locals are very influenced by the French cuisine and language. Bellinzona is located close to Italy, and when travelling there we found ourselves speaking and eating Italian. For all the different foods we tried, there is one dish I will always associate as being very Swiss… Rösti. It was a beautiful sunny morning, we went to the Swiss mountains for a 4 hour morning hike, and when we made it back down to the base we were absolutely starving and found ourselves in a restaurant ordering this Rösti dish. It came out, shredded potatoes with loads of Swiss Gruyere cheese, showcasing a poached egg. It was perfectly toasted in a round iron pan and filled us right up, I mean.. it really hit the spot. 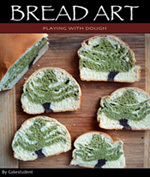 I have heard it is served differently depending on what region you are in. 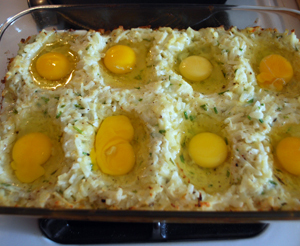 But I remember that I had it with herbs and with an egg baked right in the top. So this recipe by Cooking Light is the closest I have come to replicating it. 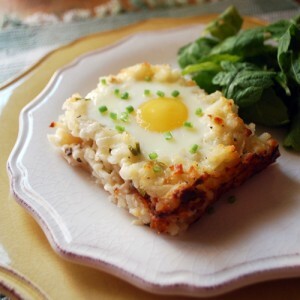 This pretty Rösti dish would be perfect for brunch… one casserole serves 8 people. 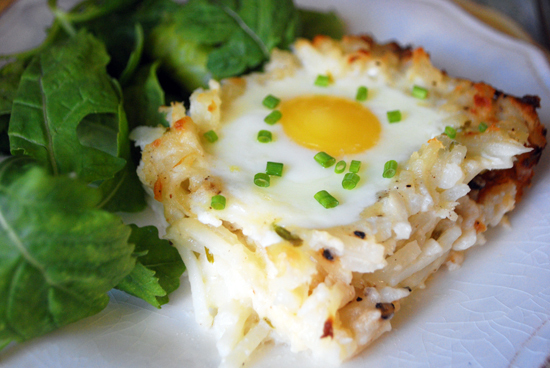 We enjoy Rösti for dinner, or for a hearty breakfast, or really any time in between. In a large bowl, combine the yogurt and flour. Then add all the remaining ingredients EXCEPT the eggs. 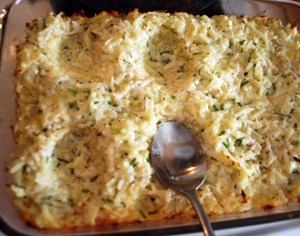 Spread mixture evenly into a 13 x 9″ casserole dish coated with cooking spray. Bake for 30 minutes, remove from oven. Using aLarge spoon, make 8 indentations with the back of the spoon. Then crack an egg into each indentation. Bake for an additional 10 minutes or until the egg whites are firm. 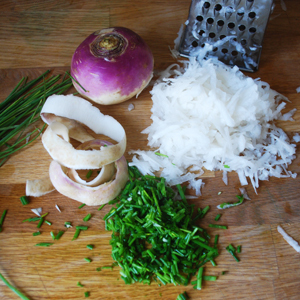 Garnish with chives and pepper.